OSWEGO- Junior Girl Scout Claudia Chetney wants all kids to enjoy the game of soccer as she has had the opportunity to do so for the past nine years. So, when the seventh grader was considering what she would do for her Girl Scout Silver Award, Chetney brainstormed on paper all the areas that she saw a need in her community and came up with helping kids with disabilities play the sports and it seemed only natural to pick the one she knew best. Pictured are: Chetney with a group of children who are currently participaing in the “Doing it Our Way” basketball program. Having a brother with a disability, Chetney understood the challenge. Chetney heard about a program called “Doing it Our Way” organized out of the Parents of Special Children Office in Fulton. The program was developed to allow special needs individuals participate in sports. “The program was already helping kids play basketball, dance, cheerlead. I figured, why not soccer?” Chetney said. 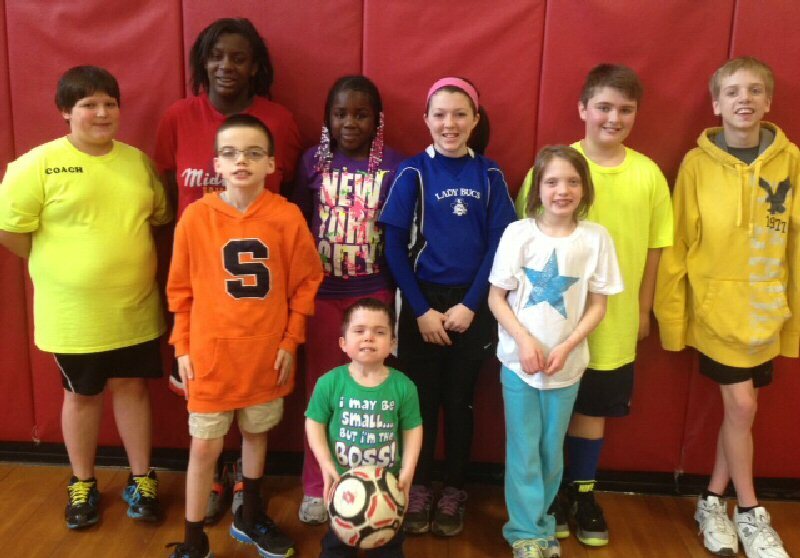 After a meeting with “Doing it Our Way” organizer Monica Stoutenger, the idea of a spring soccer session was born. Now with the help of the Oswego Youth Soccer Association board of directors who has made their facilities available, many adult coaches, and youth soccer players, children of all ages with disabilities will have two six-week soccer sessions this spring and fall. “We will be playing soccer, with no one having to worry about scoring, wining, or losing. It’s just about having fun,” Chetney noted. The first six-week session will begin May 11 at 12:30 p.m. at the Richard Benjamin Sports complex located behind Oswego Middle School, with Chetney as the organizer, and coach. “I’ve been lucky to have had so many great coaches myself over the years and many are excited about helping me with this unique opportunity to help more kids learn and have fun with soccer,” she said. Anyone interested in signing their child up for the upcoming soccer session may contact the Parents of Special Children office at 598-7672.